The large concrete canal that cuts through Tijuana’s core is usually embedded in weeds and foul smells. Last weekend, I noticed that it had undergone a major makeover. The freshly-scrubbed looked, I have since learned from KPBS-San Diego, is in preparation for the visit of famous Mexican singer Vicente Fernandez. Fernandez will be singing here tonight, July 31. The concert is free, though paid spaces were also being sold as part of a city fundraiser. For more information, go here. Live music is a constant backdrop in Tijuana eateries. These impromptu mini-concerts by guitarists and other street musicians are often inconsequential to the task at hand of scarfing down tacos and socializing. So when I heard someone strumming mid-taco at a Tacos Junior restaurant last weekend all I could think of was whether or not I had some change in my pocket for the inevitable. And then she started to sing. That was the first surprise – that the musician was female. Within seconds, she had taken command of that room with an incredibly strong and soulful voice. I don’t know what she was playing but it was a moody song that felt like it came from the gut. When she finished, the place erupted in applause for the young musician. I asked her what her name was and she said it was Alejandra Loaiza. She looked familiar and afterwards I realized that she sometimes sells candy in Tijuana’s streets. The concert left such an impression on me that I looked her up on the Internet and found that someone has posted a YouTube video of her (posted above). I also read an article in Zeta that mentions her as an aspiring actress. I would like to think that many years from now when Alejandra is famous I will be able to say I first heard her sing in a Tijuana taco place. I’ve been thinking that Tijuana needs a new anthem. 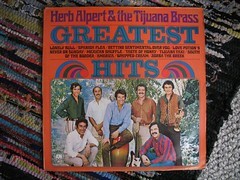 A whole generation of ’60s music fans came to associate Tijuana with Herb Alpert & The Tijuana Brass’ Tijuana Taxi, the campy song that has no words. But that wasn’t really homegrown and people just don’t dress like that anymore. See the video here. Now a whole new generation is tapping their feet to a catchy song by Tijuana’s Nortec collective called “Tijuana Makes Me Happy.” I’ll let you read this post on SignOnSanDiego to learn more about how the collective creates its music. The song doesn’t try to cover up the city’s flaws – there’s a refrain that sounds to me like “bang, bang” – and yet it’s got an incredibly upbeat vibe. Digging up more information about the song, I learned that it accompanies a movie with the same title directed by Dylan Verrechia. The independent (2007) movie, with a limited release, has attracted some indie-type awards for its Tijuana story about a 14-year-old boy, a prostitute, drugs and the border. Not exactly the kind of themes that make Tijuana’s tourism officials happy, yet the movie’s got more than 3,000 fans on its MySpace page. See the music video for yourself here. Any other suggestions for Tijuana theme songs? I would personally like to hear Tijuanense Julieta Venegas take a crack at it, if she hasn’t already.